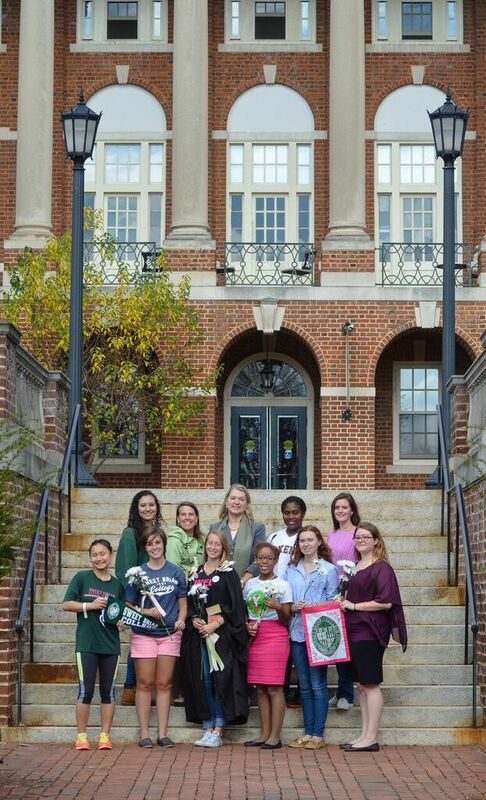 Photo captured of some of the Sweet Briar daughters (credit: Becky Johnston Lambert). How will they sustain all of these engaged alumnae? How might I harness a little of this for my institution? This blog post is about capturing the answers I’ve given so far. As I told my industry publication who contacted me about writing an article this past spring, “It is really too soon to write an article about saving Sweet Briar. We don’t yet know if she will be saved; however, once we do save her, there will be books, conferences, talks, videos, movies and who knows what else.” I am happy to share my perspective which is just that – one perspective among thousands…. Why do I love Sweet Briar so much? Sometimes it isn’t until you lose something that you realize how precious it is to you. Sometimes it takes facing that loss to tap into a love so fierce you will fight for it. 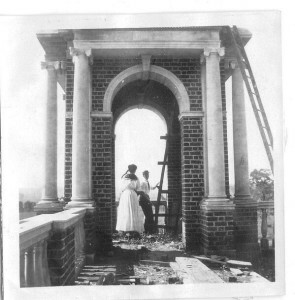 This is the kind of love that saved Sweet Briar College – and it is the kind of love that will sustain it moving forward. I did not need the College to face closure to tap into my love for Sweet Briar. 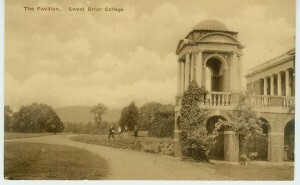 My affection for Sweet Briar College began in my senior year of high school. After moving many times and having four high schools (moving in the middle of every single year), the one thing I wanted for my College career was a place I could call home. Of course I wanted an exceptional education, but I also wanted to join a community. I had not considered a woman’s college, but it considered…nudged…beckoned….invited and held out its friendly hand…to me. 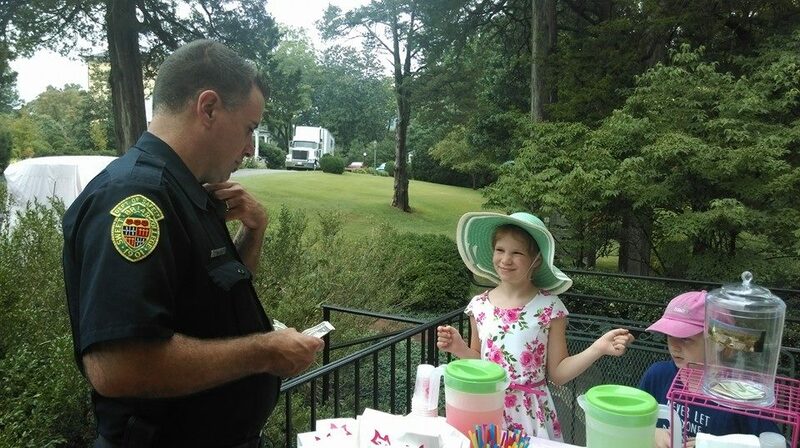 When I began to receive mail and then personal notes and phone calls from the admissions counselors, invitations to local events for prospective students in my home town (Annapolis, Maryland), I felt Sweet Briar was reaching out to me. I felt they knew me. I reached back. Like many of my fellow alumnae, my love affair was solidified when I drove up the long driveway through tall trees and reached the Admissions Office. I was home. 3,000 acres, historic buildings, renovated state-of-the-art facilities. 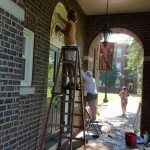 Service is a given at Sweet Briar College. Everyone does something to improve the campus while you are there. Formally, it was being an Admissions Ambassador and a Fundraising volunteer. 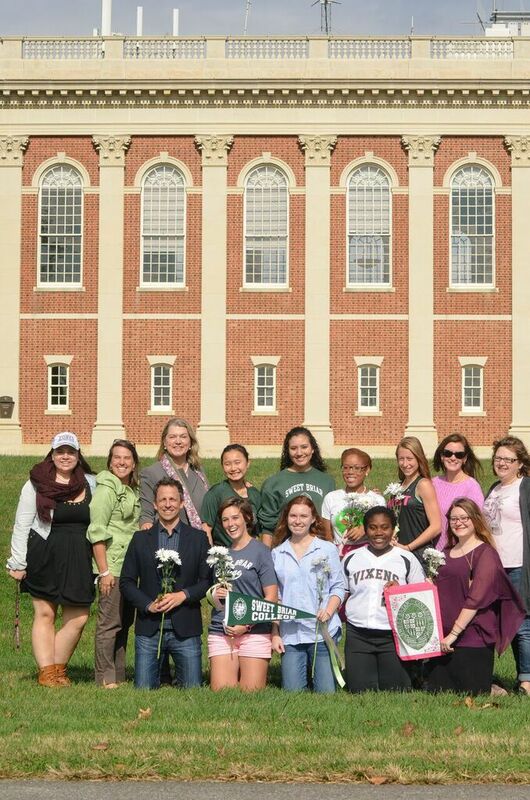 I gave countless tours becoming the “face” of Sweet Briar for others like me (and unlike me, by the way, I worked particularly hard to bring these people to campus as I believed in the value of a diverse campus back then too). At one point I kept track of how many acceptances I had (it numbered over 40 by my senior year). Sonja Gruhl Dupourque, a dear friend, is one of those who stayed on my dorm room floor and became a lifelong friend (the Godmother to my eldest son as well). I served as Resident Advisor, a member of the Student Government Association. I served in the Student Government Association and helped lead the Chapel program after serving on the search committee for the then new Chaplain, The Rev. Susan Lehman. Informally, I was tapped as a Q.V. in my sophomore year (a group that does kind things for their class) and that spirit has stayed with me since that time (my sons don’t realize those notes and candies I leave them stem from that experience). After graduation, I served as a class officer and a Reunion Chair and Agent – year after year after year. 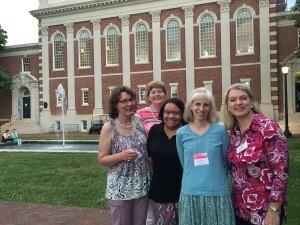 As recently as our 25th Reunion, I was still doing something for Sweet Briar, serving on the Reunion Gifts Committee. My friends who attend other schools sometimes marvel at this devotion and shake their heads. They might have LIKED their College experience, but the kind of LOVE and devotion they see in me confuses them. They didn’t know their professors personally. They didn’t dine with them at meals and visit them as friends. They left their College and rarely look back. Some of these same people are those who made pessimistic statements to me when they heard about Sweet Briar closing. 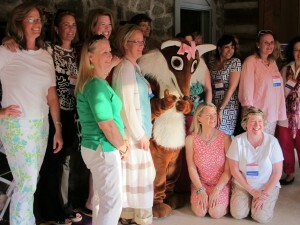 The good news for Sweet Briar (and small institutions like it) is this: I am not unique at all. There are thousands of other people like me who volunteered both on campus and from afar. 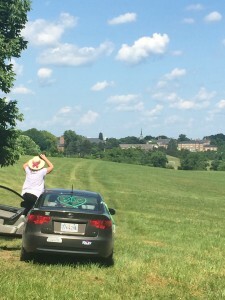 I loved Sweet Briar because it loved me. I loved it because I saw it through the eyes of prospective students and donors. I loved it because it became for me all of the relationships with friends, faculty and staff who became lifelong important people to me. Ask your alumni – often – what your institution means to them. Give students an opportunity to serve. Keep those students engaged as they become alumni. 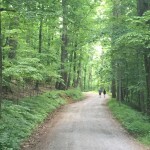 What would a world be like without Sweet Briar? Then came March 3, 2015. After the President and Board of Sweet Briar announced their intentions to close, alumnae devotion swelled. This wasn’t just like a small creek overflowing its banks and heading towards a raging river. 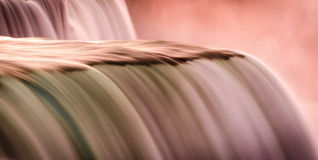 This was more like a damn where one bit of water finds its way through and then a torrent of water shooting out in all directions cascades through towns, valleys, countrysides, cities and even around the globe. They say a “rising tide lifts all boats”. In this case, the rising tide lifted all hearts, sights, minds and intentions. This was NOT going to be a sinking ship. There were those who sat back and rearranged deck chairs on the sinking Sweet Briar. From their perspective, there was no hope. There were students, faculty, staff and alumnae who were resigned. From my perspective, the closer someone was to a staff member or board member, the more they could not see any other possibility. I know what they were saying because I spoke to many of them on the phone. Visiting campus for the “last” Reunion in May 2015, it was clear that the majority of campus was preparing for closure. Hallways were lined with moving boxes, offices were empty, even the Chapel sacristy had gaping cupboards and overturned chalices. It was a dismal scene. The interesting thing is that this dynamic repeats itself everywhere. There are always unhappy students, faculty, staff, alumni and others who see a half-empty glass where other see a half-full. There are always the nay-sayers, the pessimists and those who actively work to tear down their institutions. Particularly when there is a negative situation — someone being fired or stepping down from a board or being forcibly kicked out — it is very likely those people will slam the institution. I call this the “slam the door” syndrome. They cannot leave a place unless they are angry and they tear it down. It happens in relationships too, sadly. For students, only a select few were bold enough to speak out against the closure and to fight for what they thought was right. I’ve spoken to a few of the students (and their parents) who endured during this time. It was incredibly difficult to speak out for possibility and many of them were treated very badly for it. Most students, according to these braves ones, aligned with the administration. They prepared for the final days. Fortunately, there were others within the College community who saw possibility where others saw dispair. Some students hung banners and worked to raise awareness. Faculty and staff took time to hold hands, comfort and even wage their own lawsuit for unfair termination. Outside the Community, alumnae did all they could from writing op-eds to giving to providing moral support during legal proceedings. 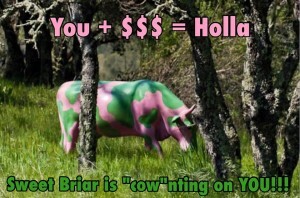 Sweet Briar’s President and Board did not feel they could trust their alumni to be honest about the financial condition. They had the opportunity with a Donor Insight Survey, but they elected not only not to be honest with alumnae, they also weren’t candid with the staff conducting the interviews — or the firm charged with conducting the survey. They felt surely if they were honest, no one would give and they would be in an even worse position. This is pretty commonly accepted in marketing and fundraising. The belief seems to be that sending messages that are positive and filled with “excellence” is critical for people to invest. The problem is, being honest with the very people who can help you is also critical. In another blog I wrote about an institution I worked for who also faced possible closure – they chose to be honest. It works. Not only is honesty the best policy, crisis messages call people to action. I once had a staff member who worked for the Chesapeake Bay Foundation. She was an exceptional fundraiser. In one meeting she asked, “So when are we going to use a crisis message?” This shook us all up. We never did. She pointed out that their Foundation solicits almost seven times a year and usually one or two of those appeals has a crisis message. There is always something in any institution that deserves raising up for constituents. What is your “crisis message” and how can you help your alumni see why their gift matters to your institution? People tapping into how much they love a place engages them. You must be honest and let your constituents know where problems exist — and how they can help solve them whether budget shortfalls or volunteer hours. Chances are, your alumni will rise to the occasion. We have nothing if we do not have activism. Activism breeds engagement. Banners protesting the closure and leadership hung from balconies, the bell tower and buildings. Devotion took many creative forms. Each person did what they could do and tapped into their unique set of time, talent and treasure. For me, the logical thing to do was to raise funds. This is what I do for a living and I figured I could do that for Saving Sweet Briar. The problem was, we had no records. Social media became the primary vehicle for communication and sharing. I had no “tools of the trade” I was used to having. I had no lists, no research department, no annual giving or major gift data. A group of faithful people recreated lists based on old magazines with giving records. Someone who worked in the catering department found a table seating list from a former campaign dinner and thoughtfully entered those names onto a spreadsheet. The Board of Saving Sweet Briar – an incredible group – set out to wage a legal battle and then began receiving funds. Lots of funds. Most organizations have a gift processing department and database managers. These dedicated volunteers did not have the infrastructure for gift accounting and they did an admirable job considering that. Everyone did the best they could tapping into systems they knew. The lawfirm which led the original suit provided important services beyond legal including accepting pledges and gifts in the early days. It was and is a marvel to me how we managed to make it through those days. It bordered on chaos and a lack of clarity, but with a pure motive we made calls, accepted gifts and loyal donors sent them. Over and over again. I sat down with my list and I started to make calls. I reached people via Facebook messenger, web searches and friends of friends. It truly was a remarkable process. I wouldn’t know if people gave; however, unless they told me. We had gifts going to a lawfirm, we had gifts made through Paypal, we had people sending funds to people they knew. I kept the people I called as a “portfolio” like I do at work sending them occasional updates. We have got to keep our blinders on. We have funds to raise and keys to get back. It’s not going to be perfect. Perfect is the enemy of progress. I now have this printed on my computer at work. It is so true. There is always something to be worried about and nothing is ever perfect. You don’t need perfect spreadsheets, amazing databases, super software or approved scripts to be a successful fundraiser. You need passion, honesty and tenacity to just keep going. Class of 1988 classmates – one all the way from Singapore — attended an alternative reunion. Events were held all over the country. Events popped up everywhere from small towns to big cities to around the globe. Never mind we didn’t have complete mailing lists. Never mind we needed every event to be a fundraiser with an overt “invitation to give” (this is usually something people try to avoid). Never mind we often didn’t have enough “proper response time”. The events were held and they were successful. A whole team of volunteers worked to coordinate these events and get them published so that people could attend events wherever they were. 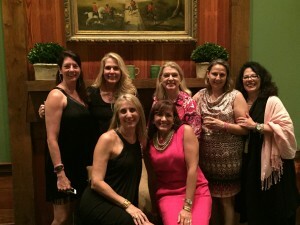 One event in Atlanta raised over $1 million organized by local volunteers with special guest, Teresa Pike Tomlinson, Mayor of Columbus Georgia (and now Chair of the Board for Sweet Briar College). Events were important. They built momentum. They got the word out. They got people feeling they were part of something bigger than themselves. Most importantly, they forged new relationships and friendship. People affiliating around a cause they believe in is important. Providing opportunities for gathering is so important. Using events to provide updates is critical. Beyond my Committee, there were many other committees at work – informally and formally. Each of these committees had someone at the helm who cascaded messages on a regular basis. Evangeline Taylor, an amazing woman, agreed to be a coordinator of coordinators! Regular updates with news releases, legal updates and upcoming events were sent to State Representatives, Class Representatives, Committee Chairs, Event Chairs. Some people wore multiple hats like my classmate, Katie Keough Widener. She started out as a Class leader, then took on the state of Pennsylvania and then joined the Major Gift Task Force! The saving Sweet Briar Major Gift Task Force meets for the first time in person. The question now arises – what to do with all of these volunteers? Life will rush in and fill the places Sweet Briar once occupied. One of the suggestions I made to the board and College leadership was to consider hiring volunteer coordinators or alumnae engagement professionals among the first to be hired. Formal structures will exist, of course, but not everyone will be able to join those structures. Committees like Admissions and Development of Boards often include non board members, but there usually are not volunteer structures around academic programs, buildings and grounds, etc. If you do have strong volunteers who have proven themselves, it might be worth personally asking them to step forward to serve so that you don’t lose them. Asking people for their “recommendations for strong candidates” sends the message to a volunteer that they must not be needed anymore – or their efforts didn’t meet the criteria of a formal committee. Once leadership structures exist organically, try if possible to continue them. Once volunteers are engaged, try to find a way to allow them to continue. 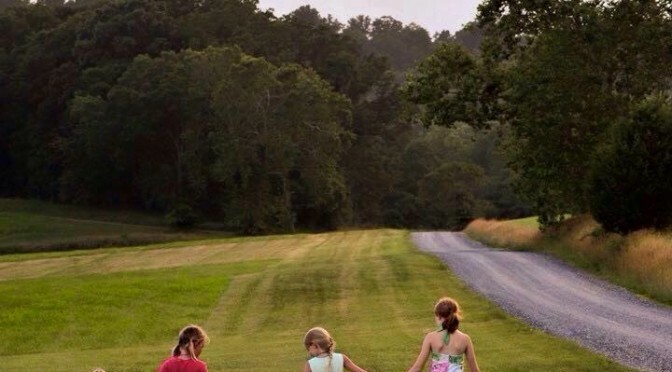 Up until March 3, Sweet Briar was an important part of MY life, but I wouldn’t say it was on the radar of my children, cousins, husband, community. As my friends, family, neighbors and community began to pay attention to news media and the legal fight, they began to express support for Sweet Briar, Women’s Education, Liberal Arts Education, the list goes on…. 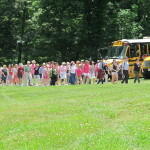 Events were held that included families for picnics, bike rides, museum visits. Some spouses and partners REALLY rolled up their sleeves (mine included) to support Sweet Briar from financial support to doing legal research. One couple I met along the way who inspired me are Christine Bump and Elias Papasavvas. Are you engaging the families of your alumni? Are there family-friendly activities for them? 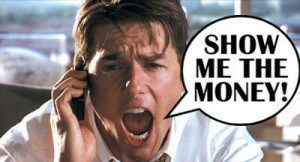 Are you including spouses and partners in your fundraising calls? Children of alumnae sold lemonade, donuts, cookies and art to benefit their Mom’s College. In this photo, Joan Dabney Clinker’s daughter sells a donut to campus security. 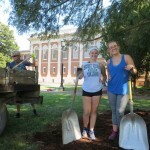 Alumnae, family and friends came together over the past few weeks to spruce up the campus prior to the students’ return under the guidance of Jen Staton and Debbie Thurman. Tom Connors, VP of finance, estimated that 4200 man-hours were donated resulting in an approximate $60,000 savings in maintenance costs for the college! Jen Stanton and Debbie Thurman, Work Day Organizers. People don’t always like to be led, but they need it. The Saving Sweet Briar board assembled itself organically quickly after the March 3rd announcement to both fight an important legal fight as well as to raise funds. 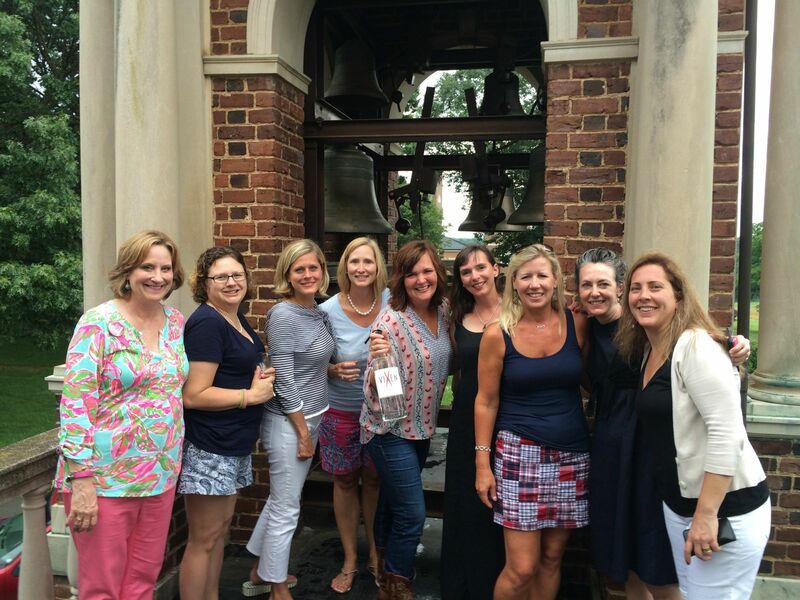 These women will forever be an important part of Sweet Briar College. They are just as important as the founder, Indiana Fletcher Williams, in terms of creating a vision and pointing to a future. Indiana Fletcher Williams pointed to a vision of a College in perpetuity. The Saving Sweet Briar Board stepped in when that perpetuity was threatened. There are other leaders who stepped forward to help launch additional legal suits and provide support to those who led them. Without these leaders – both self appointed and supported with grass roots support – Sweet Briar would not likely be open today. Initially, everyone looked to one group for leadership. In time, people did what they saw needed doing. This level of engagement was self-appointed and critical for the ultimate success. If everyone sat back and waited for direction, we likely would not have reached the successful conclusion in the end. The Saving Sweet Briar Board always said it was a temporary one. This must have been difficult for them and they deserve admiration for seeing this vision. From the beginning, they simply asked to have a voting majority of the Sweet Briar Board. Their intention was to become unnecessary because the goal was to keep the College open and channel the support there. Ultimately, the Board who voted for closure all resigned. Saving Sweet Briar and the parties to the other law suits provided recommendations for new Board members through mediation. It is hard for me to find a replicable instance of this for another institution. Except perhaps to say – don’t be afraid to embrace an organic leadership structure that emerges. It may be that leadership structure will have an energy you need and become the fuel for your current leadership. It is worth noting that the Alumnae Association of Sweet Briar is entirely revamping itself. They realized that their previous relationship of being completely a part of the College resulted in tensions and difficulty when the College elected to close. Their independence is a strength. Institutions often forget that they have neighbors. It is very important to maintain close ties to the community and region nearby. These neighbors are impacted by students who may live in off-campus housing. The elected officials may prove critical at some point. For Sweet Briar, it was the County of Amherst who came to its rescue. The County Attorney was the person who originally filed suit to stop the closure and who advocated for protecting donor’s rights. The Mayor of Amherst wrote amicus briefs regarding how the town and the College had shared infrastructure, investment and both would be harmed if the College closed. Take time to get to know your elected officials and community members. Identify the faculty and staff who live nearby. Consider days when the community can visit to interact with your student body. Keeping the relationships strong will avoid the divisive issues of “town vs. gown” which many communities face. Amherst and Sweet Briar have a shared history and future (I explore these relationships in my blog “What’s In a Seal”). 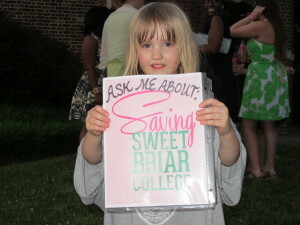 Saving Sweet Briar logo and the website www.savingsweetbriar.com became important symbols and community builders. 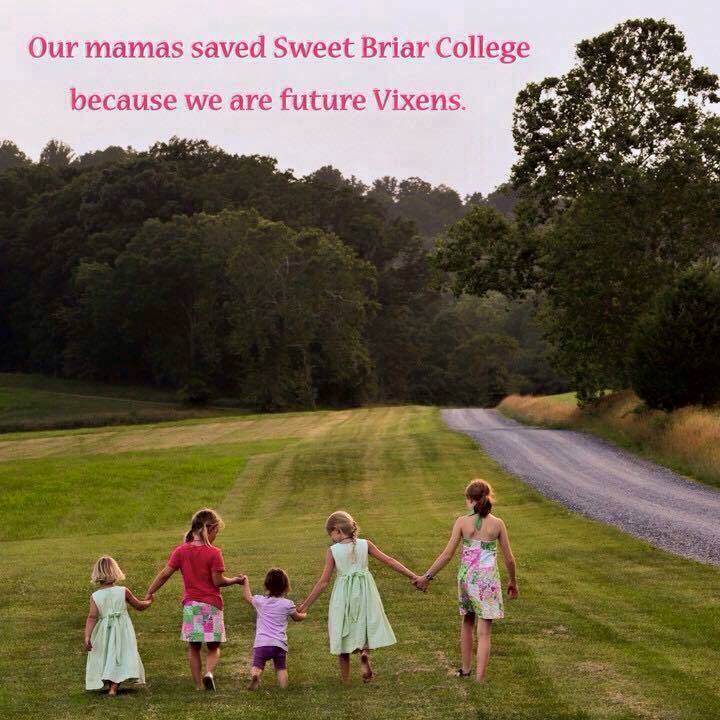 I often tell people, if it were not for social media, Sweet Briar College would not have been saved. If this closure had been announced before social media, the alumnae and friends would have had no way to mobilize so quickly. 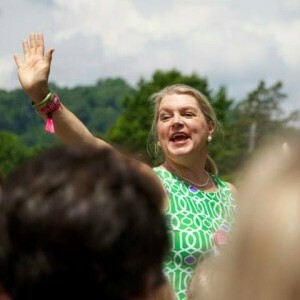 Brooke Linville, Saving Sweet Briar Board member, created the website and it became a portal to organize: legal updates, recent news media, testimonials, fundraising updates, links to events. The website was critical for communicating — especially since the College was busy posting closure messages daily. Other channels of social media were also critical. Facebook, Twitter, Linked In, Reddit, Instagram, Pinterest. 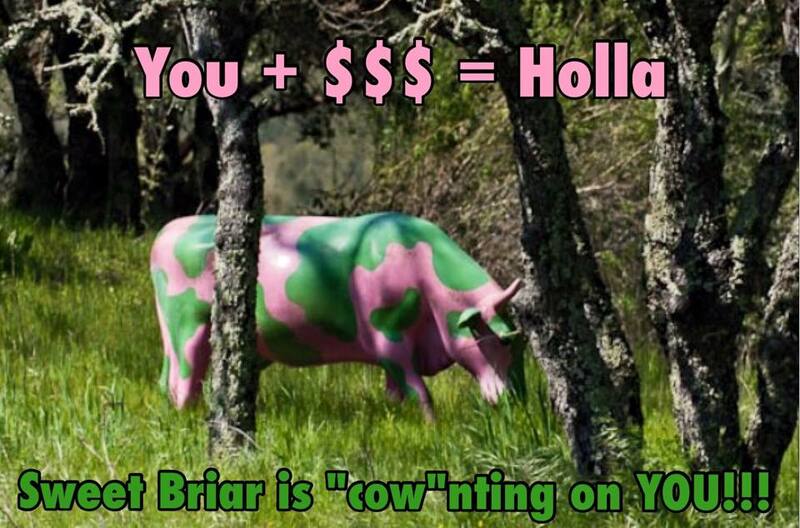 There truly was not a form of social media that was not used for the benefit of Sweet Briar. 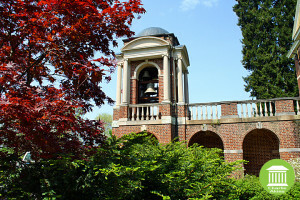 In fact, Forbes Magazine launched a contest based on twitter posts resulting in Sweet Briar being awarded the “top small college”. Facebook became a place where people could organize themselves, vent, research, post events, inform. As of this writing, there are over 20 different sub-pages fueling the passion and commitment for Sweet Briar. Students, parents, faculty, staff, alumnae and community could bond together over shared issues, concerns and hopes for the future. Eventually, many of these channels split into further categories. 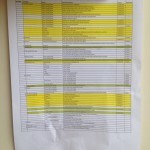 Some even became their own websites such as the strategic planning work, www.sbc2point0.com. Just as in any group, human nature plays a part. Some people get emotional and angry about things. Some people like to keep the peace. Some like to follow the leader. Some are naturally suspicious. Some see their role as policing. Eventually, not all of this energy could exist in the same place and individuals created conversations and pages. Just as there are those who might have a chat on their way to class or over the phone in private, social media provided a place where the dialogue of saving Sweet Briar reached a fever pitch. Having received invitations to the majority of the groups formed, I can say we needed everyone and every group to get to a successful conclusion. Also just as in any group, stereotyping of these groups also took place in addition to not understanding and pointing fingers. There isn’t one group of which I was a part where I agreed with everything, but I felt I was of more use being there than not. The question is now, do we still need those groups? I think we do. The question for your institution may be, to what degree do you allow and foster the organic energy of your constituents — or do you try to control all channels of social media? As I write this post, students are driving to campus and faculty and staff are there to welcome them. Each day, smiling faces of returning students are shared. Colleges released coaches and faculty from contracts so that they could return. 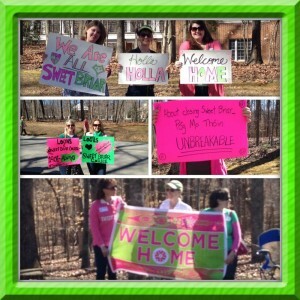 Colleges released students from enrollment contracts so that Sweet Briar could welcome them home. 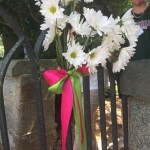 These acts of friendship will be long remembered from Hollins College, Agnes Scott and many others. The College announces “appointments” for staff positions on a regular basis. In order to open its doors, positions had to be filled quickly. The leadership evidently feels that there is not time for national searches (which can take weeks and months in some institutions of higher education). A combination of volunteers and appointed staff fill key roles in Admissions, Development and administration. These roles are temporary, according to President Stone, and in time there will be national searches to secure permanent professionals for the long term. Some of these interim candidates will become tomorrow’s internal ones and their service may be longer than a short-term assignment. Just as in the early days of Saving Sweet Briar, there were no rules or a playbook to follow. These are unprecedented times for the College. Those closest to those in leadership know what the needs are and who is available to get in their car, take residence in one of the homes on campus and get to work. Those further afield stand back to see what role they may play for the future – or not. 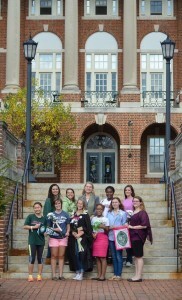 Life does and will rush in to fill the time that alumnae gave to Sweet Briar. Formal positions are not going to be available for all. Volunteer positions may also not be available either as the Colleges shifts into more traditional Board Committee structures. Dear AARs – We will be up and running shortly – I so very much look forward to working with you as the new Director of Alumnae Admissions Relations! It is a title I covet – be gentle with me to begin with – we are still actively working hard on the incoming classes of 2015-2016 – we will VERY soon slam into action with regard to our recruiting schedule for 2016-2017 – home run, my friends – home run!!! It remains to be seen whether returning faculty will be as open to alumnae engagement in their respective fields. Faculty members do not usually have a team of professionals wishing to advise, revamp, change, etc. Yet, there are hundreds involved in key areas such as STEM and other fields. Perhaps Sweet Briar will adopt a Program Advisory Model that some Universities employ. 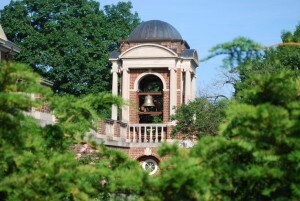 One thing is for sure, everything at Sweet Briar will change and the curricula must as well. For me, I’ve spent the last few weeks confirming pledges. All of the different gift accounting processes and procedures needed to be firmed up to hand over the most accurate records to the College. I counted up one afternoon 188 phone, email and in-person contacts on the list assigned to me. The final settlement agreement payment is slated for September 1 and the efforts are on track to make it. I must admit to feeling a bit bereft as the tide ebbs back from this high level of engagement and dedication. 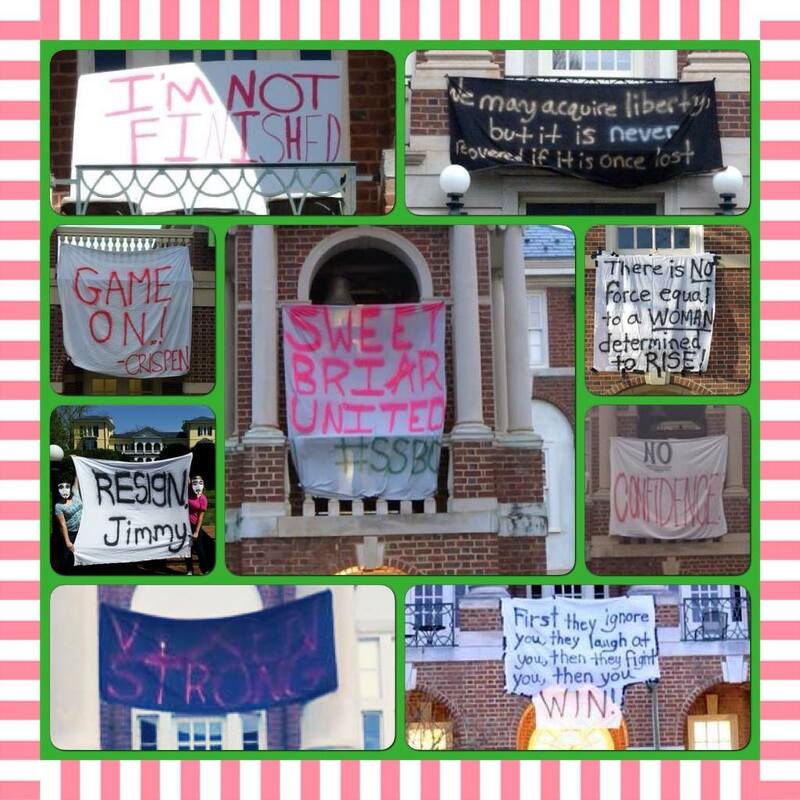 I am incredibly proud of Sweet Briar. We have made the national news and overturned a decision some thought was fatal. It has been an honor to serve alongside volunteers working so hard. Some volunteers around me are tapped for staff roles, board roles or other official duties. My role along with many alumnae is uncertain. At Sweet Briar, “impossible” is just another problem to solve. I have always been moved by Independence Day. Through one of my ancestors, Susannah Lytle, I am a Daughter of the American Revolution. It all seemed like very distant history to me for most of my life. It is hard to imagine what our forefathers did for us as Americans or what life was like as colonists. That is, until recently. I have a new appreciation for what it is like to live through a revolution — the saving of Sweet Briar College. 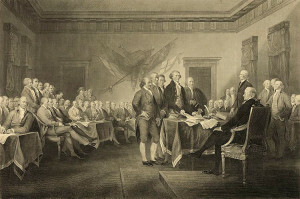 One of the nicest traditions I have enjoyed over the years is reading the Declaration of Independence on July 4th. Elsie Baxter Heckel started my family on this tradition before my sons, Kent and Leland, were born. This was a family tradition of hers starting long before Elsie could remember. Each summer on Independence Day after a day of sun and fun, the family gathered for this tradition. Just before dinner, everyone would gather on the broad sun porch. Every chair was filled, children sat on the floor. The aroma of dinner, started much earlier in the day, filled the room. The yellowed, well-worn pages of this version of the Declaration of Independence came from Elsie’s membership in the Daughter’s of the American Revolution. It was about the size of a small paperback book. If you don’t have a copy at your home, you can view the text from the National Archives. Outside, motorboats buzzed by, children played in nearby yards and the sounds of summer filled the air. Inside, we were brought back to the horrors the early revolutionaries endured at the hands of a tyrant King. Every few paragraphs, the book would be handed to the next person. Fireworks – always a fun Independence Day tradition. 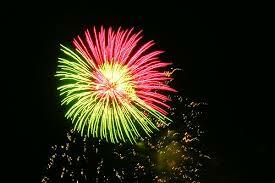 Until I discovered this tradition, Independence Day was all about flags, fireworks and fun. Reading the Declaration of Independence with all of its “facts held out to a candid world” brought special meaning to the waving flag and a newfound respect for country. 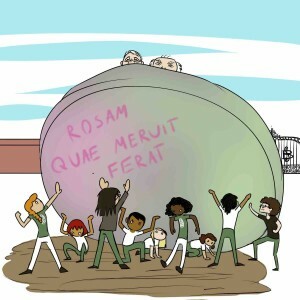 This year, the Declaration of Independence has fresh meaning for me as I have just gone through my own “revolution” in the saving of Sweet Briar College. I have read the Will of Indiana Fletcher Williams and lived the revolution brought about by those who have fought to honor it. Indiana Fletcher Williams established Sweet Briar College through her will. As I read the words this year, it brought to mind the journey of thousands of students, parents, faculty, staff, alumnae and friends…. Just as the inhabitants of these United States listed their grievances with the King of England, those who love Sweet Briar College have pursed legal action since March 3, 2015 to fight the attempted closure of the College they love. The phrase, “When in the course of human events, it sometimes becomes necessary for one people to dissolve their political bands which have connected them with another…” has new meaning for me. I don’t believe I have ever experienced anything as unifying as the movement of Saving Sweet Briar. The causes which impelled those saving Sweet Briar were declared in legal briefs, on bedsheets, in blog posts and in the national media. 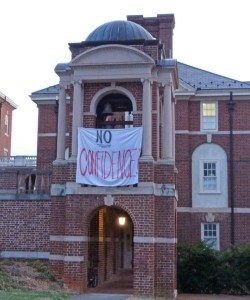 A “No Confidence” banner hangs off the Sweet Briar bell tower – a symbolic heart of campus. As I read the words, “That whenever any Form of Government becomes destructive to these ends, it is the Right of the people to alter or abolish it, and to institute new Government….”, I am so grateful to the early revolutionaries of the United States. It also makes me think of the revolutionaries of the Saving Sweet Briar Board who boldly put forth their own funds, time and talent to fight a cause they felt was worth fighting. I, and thousands along with me, will honor them as revolutionaries of our time. Joining them are the legal teams – and those who supported them — representing students, faculty, alumnae and the Commonwealth of Virginia. Faculty and staff boldly spoke out. Like the newspaper publishers of days gone by, writers of blogs and opinion pieces cried out against injustices and raised their truths. All put forth a new vision and foundation for the future. 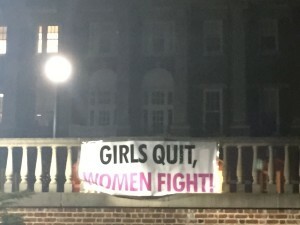 “Girls Quit, Women Fight” banner hung outside Benedict Hall at Sweet Briar College, the night of what the College declared “it’s final reunion”. The lawsuits of the students, faculty, alumnae of Sweet Briar College and the Commonwealth of Virginia petitioned for injunctions to halt the closure of their beloved College. They listed their own usurpations as our forefathers did. While we were not fighting for our farms, our passion certainly runs strong. New leadership takes hold at the end of this Independence Day weekend. The new Board of Directors is comprised of leaders from many economic sectors united in a desire for Sweet Briar to exist in perpetuity. Students, faculty, staff and a new board return to Sweet Briar for a new academic year. All of these women and men are revolutionaries! 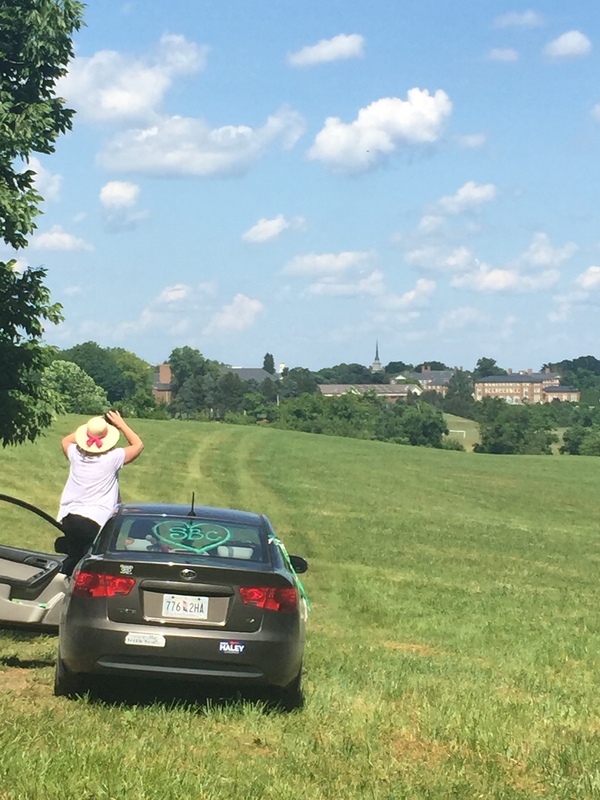 July 2nd – the day Sweet Briar keys were turned over to those who worked to save it – will always be our Indie-pendence Day! There are many leaders who worked tirelessly in the effort to save Sweet Briar College. Christine Bump, JD, MPH, Sweet Briar College Class of 2000, is one of those heroes. I met Christine shortly before we both appeared on a WJLA TV7 interview in May, 2015. My husband and I had the pleasure of meeting Christine and her husband, Elias Papasavvas, at Reunion, 2015. This is a power couple if there ever was one and they will play a pivotal role in years ahead . Christine and her husband have made a perpetual commitment to Sweet Briar College. I share it with you here as a guest post and for the professionals at the College to consider as they look to the future. 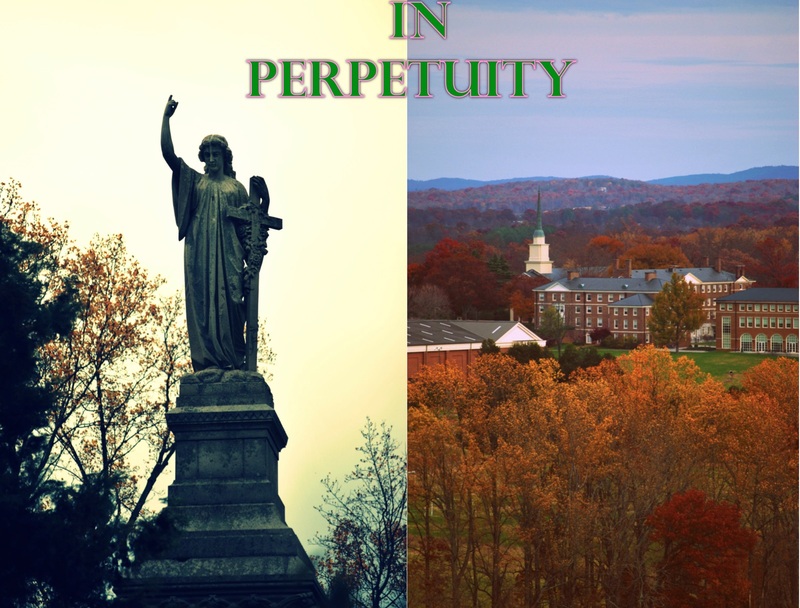 I love the idea of a Perpetuity Society as it demonstrates the kind of commitment I feel for Sweet Briar College as well as the type of relationship we will need with alumnae and friends in the years ahead. P.S. 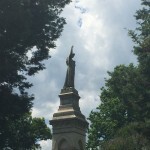 I have had Sweet Briar College in my will and was on a list to be buried on Monument Hill. I have made a commitment – a stretch commitment more than I have ever pledged — to Sweet Briar College over the next five years. 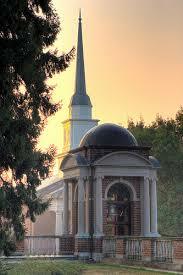 I pledge to give to Sweet Briar perpetually. a thing that lasts forever or for an indefinite period, in particular. the state or quality of lasting forever. 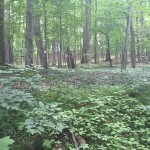 Since we were thrust into the battle to save our beloved Sweet Briar, much has been written about the word “perpetuity.” Indiana Fletcher Williams demanded in her will that her land be used in perpetuity to educate young women like her daughter Daisy. Over the past few months, thousands of excellent ideas have been presented regarding fundraising, loyalty, and commitment, in order to ensure that our Sweet Briar College “not merely endure, but prevail,” as Judge James W. Updike, Jr. noted in his courtroom remarks on June 23, 2015. On that day, which Amherst County has already commemorated as “Sweet Briar College Day,” he blessed the settlement accepted by all parties to keep our College open. When it was noted during the hearing that the actual text of the agreement is “for one year,” Elliott J. Schuchardt, the attorney representing a group of Sweet Briar students, parents, and alumnae pro-bono, replied, “This is not for merely one year. It is for perpetuity!” The entire courtroom erupted in applause. Indiana Fletcher Williams established Sweet Briar College through her will as a perpetual memorial to her daughter, Daisy. 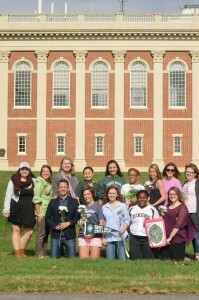 The Sweet Briar College Perpetuity Society would be for all alumnae who accomplish two things: (1) donate every single year, without interruption, from the year of their graduation until their passing; and (2) include Sweet Briar College in their will (which today is recognized as the Indiana Fletcher Williams Society). Living members who give annually without interruption since graduation would comprise the membership and they would continue as members so long as they do not interrupt their giving. 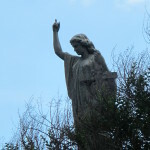 Angel over Daisy William’s monument. You may ask why we need another giving society. The Perpetuity Society would not be based on the amount of money given. Whether an alumna gives $5.00 a year or $5,000,000.00 a year, the amount does not matter. 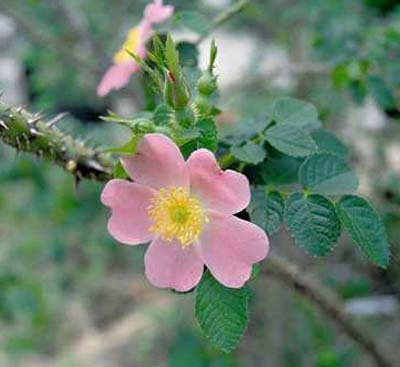 Also, Sweet Briar has the Pink Rose Society and the Silver Rose Society, recognizing giving over a period of years, i.e., at least 10 out of 24 years. Membership in the Perpetuity Society would demonstrate an unfailing annual commitment to Sweet Briar, year in and year out. The Perpetuity Society would not abolish any other giving society; giving amounts, giving over a period of years, and including Sweet Briar College in your will should continue to be recognized by the existing societies and circles. But, the establishment of the Perpetuity Society could encourage the continuation of the momentum of giving and loyalty we have now to ensure Sweet Briar prevails in perpetuity. 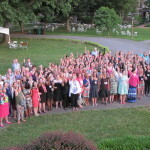 In recognition of how important Sweet Briar’s perpetuity is, the Perpetuity Society should have leaders and activities beyond the walls of the College’s Development Office. It should not just be a list, it should be a membership of those who show the ultimate support: a commitment to Sweet Briar’s mission of turning young women into leaders through stellar education, in perpetuity. 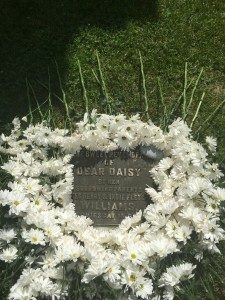 Daisies surround the monument to Daisy Williams during the Founder’s Day ceremony, 2015. The Sweet Briar Perpetuity Society. In honor of our College’s history. In remembrance of the battle that saved her. In resolve to ensure Sweet Briar thrives, in perpetuity. Christine P. Bump, JD, MPH, is a proud graduate of Sweet Briar College. She was a Presidential Medalist in the Class of 2000, and earned her professional and graduate degrees from Emory University’s School of Law and Rollins School of Public Health, respectively. She practiced food and drug law for nine years in Washington, DC, and in 2013, was selected as a Rising Star by Washington, DC Super Lawyers. Christine has supported Sweet Briar financially and through volunteer hours every year since graduating, and is excited to continue that support. You might also consider reading this post: We Saved Sweet Briar – Now What? To learn more about saving Sweet Briar College, visit the Saving Sweet Briar website. To learn about plans for the future, visit Sweet Briar 2.0. 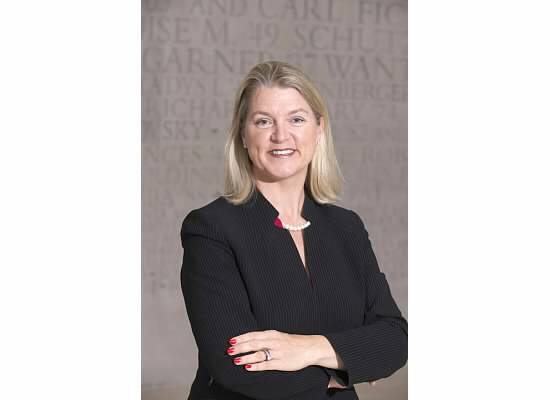 Stacey Sickels Locke, CFRE, is a proud graduate of Sweet Briar College, Class of 1988. She served as an employee of the College in the early 1990s working on the $25 million Campaign. During that time, she solicited many leadership gifts which make up the current endowment and she feels a sense of duty that those donations are not used for the closure of the College or for any other purposes than the donors intended. 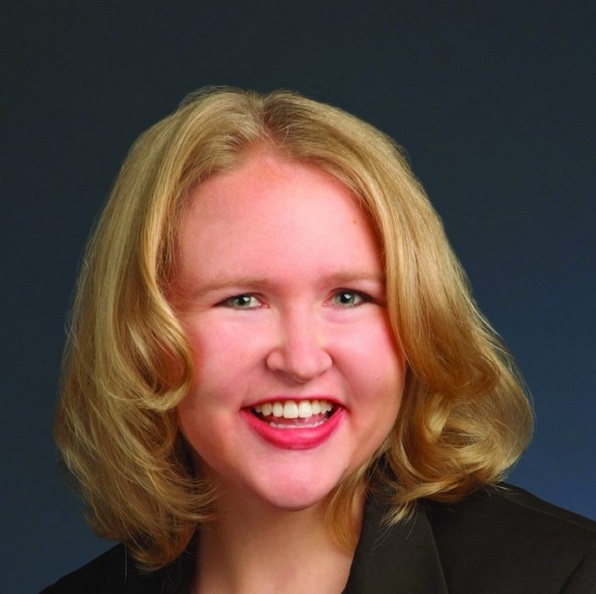 Since then, she has spent her career building support for higher education and the nonprofit community as a staff member and consultant for boards. 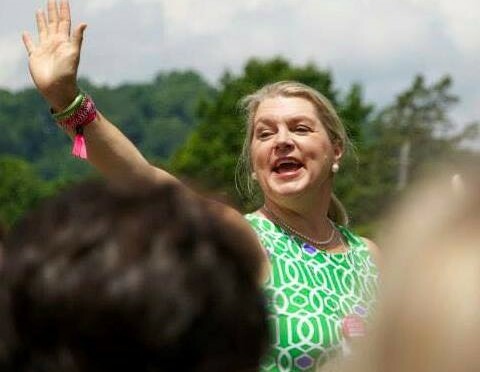 As a volunteer, she has served Sweet Briar since graduation as a fundraiser, admissions ambassador and now advocate for the #saveSweetBriar movement. She raises funds for Saving Sweet Briar, a charitable organization committed to the future of the College She is a member of the Association of Fundraising Professionals (AFP), is affiliated (through the University of Maryland) with the Council for Advancement and Support of Education (CASE) and holds a Certified Fund Raising Executive (CFRE) certification from CFRE International. All my life group and team dynamics have fascinated me. As a psychology major at Sweet Briar College, I read my textbooks with great interest and began applying that insight in my life. Over the years, I have supervised hundreds of people, coached synchronized skating teams, served on boards and, more recently, experienced the intense team effort to save Sweet Briar College. One of the most helpful and elegant models I have found in understanding human and team dynamics comes from Bruce Tuckman, PhD. 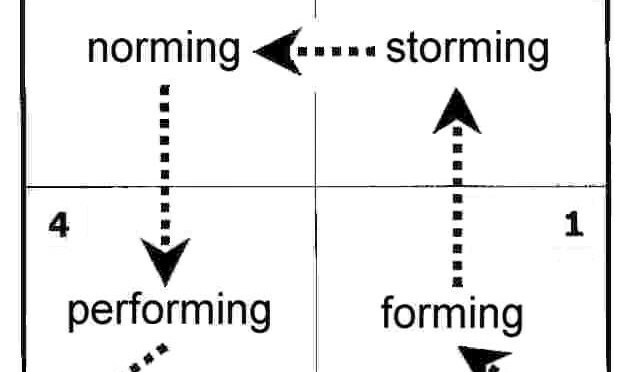 His model is the Forming, Storming, Norming, Performing Model. He added a fifth stage later in his career “Adjourning”. This model provides reassurance for those living through a time of uncertainty now. Applying the Tuckman model helps understand both the individual and team dynamics. When a team forms, there is high dependence on a leader (or perceived leader) for guidance and direction. There is little agreement on the team’s aims and activities unless direction comes from the leader. Individual roles and responsibilities aren’t clear and often are not yet defined. Leaders will be besieged by questions about the team’s objectives, purpose, motives and relationships. A stone laying atop Indiana Fletcher Williams grave, “Believe” sits next to Daisy’s resting place. On campus, faculty and staff faced an uncertain future. Those working under the leadership of the President and Board followed their path to closure. 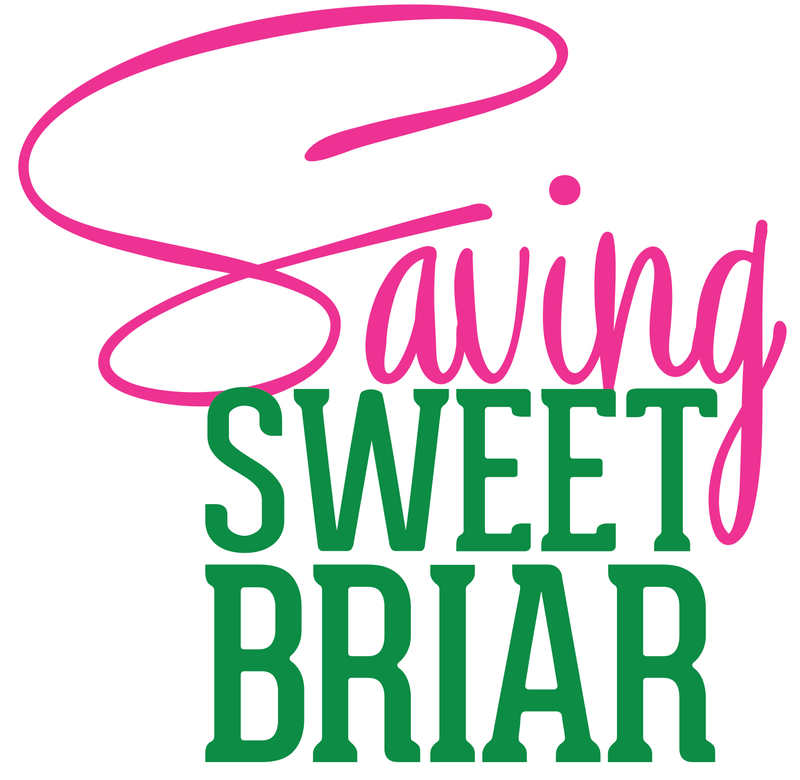 Saving Sweet Briar, Inc. formed and appointed a Board. They secured legal counsel to launch an important legal challenge. Their charge and mission was clear; however, there was a misperception that they would or should have the answers to all questions and provide all direction — which was impossible and not their charge. 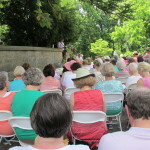 Stakeholders of all kinds were filled with questions and they directed them in many directions, including the volunteer leaders of Saving Sweet Briar. 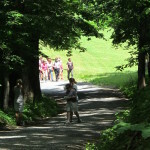 The many stakeholders of Sweet Briar were uncertain as to who was leading them. People waited for direction and answers — answers that sometimes couldn’t be provided given the confidentiality of a legal case. Social media allowed for teams and subgroups to organize themselves around work they found important: Students, Admissions, Research, Parents, Friends, and many more. During the early formation of the teams organized to save Sweet Briar, I was unsure as to my best way to contribute. As a fundraiser, I saw the need to raise money. As someone who has worked in higher education for much of my career, I was called to take some of the issues I felt were important to a broader audience. I turned to my blog. My march blogs grappled with the broader issues I saw. Looking back, “forming” was inevitable. It was understandable. The fact that this is normal is one of the reasons we must look back with an open mind at both perspectives — those who worked to close and those who worked to save. Each had their respective leaders and followers who were moving towards — and directed towards — different futures. 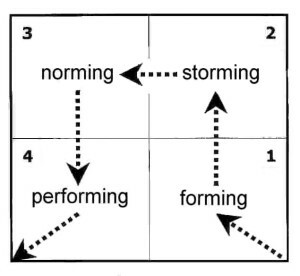 Storming is a normal phase for all teams and teams return to this phase when there is a change (such as a new leadership, key decision, even victory). In this phase decisions do not come easily in the group. Team members vie for position as they try to establish themselves in relation to other team members or the leader. The leader will receive challenges from team members. Team members will attack each other, especially those who may not appear to comply with what they perceive to be the leader’s goals. Clarity of purpose grows, but plenty of uncertainties persist. Power struggles are the norm and factions will form. Chaos reigned in the following weeks. Chaos of all types. Students protested the Board’s actions with banners hung from balconies and the bell tower. Faculty unanimously voted no confidence in the leadership. Additional suits were filed on behalf of faculty, students and an alumna. 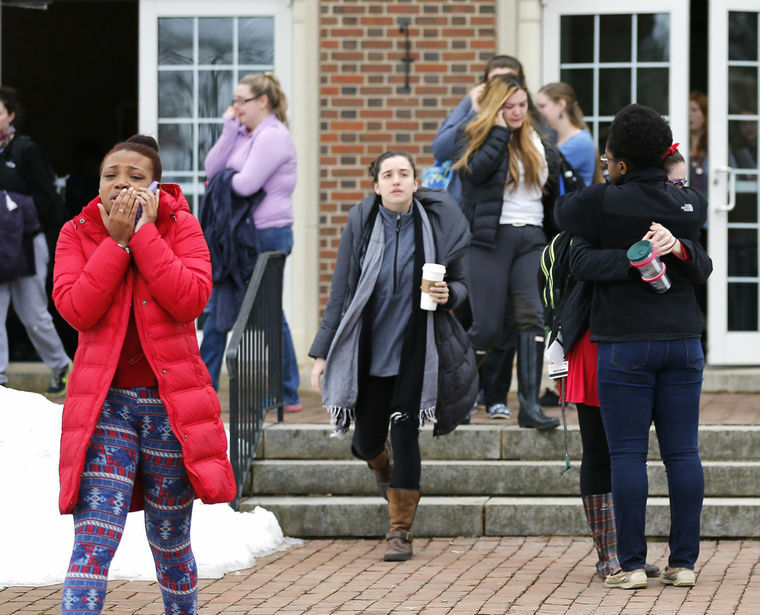 Social media provided a forum where various people and teams working to save Sweet Briar organized – and divided — themselves. In the weeks after the initial announcement of closure, “storming” was alive and well. The different groups working on the issues they felt were important experienced internal and external challenges. Different teams questioned motives of others. There was a strong desire to have “one” voice, “one” approach and to muffle any external statements that didn’t comply. 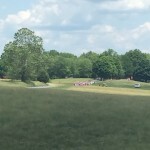 National media reported on the “fight” to save Sweet Briar. Board members posted opinion pieces. Op-eds, blogs, articles and social media brought to light the many issues of concern: Donor rights, honoring the founder’s will, faculty contracts, and more. The “us” and “them” felt as deep as the Grand Canyon at this time with Board members and “closers” (as they came to be called) fighting it out in Court, through social connections and in the national media. During this time, I wrote some of my strongest blog posts about what I felt was wrong. My discontent also took the form of frustration with the lack of process and procedure with the efforts to save the College. I also was – true to form – frustrated with my leadership. I wasn’t used to leadership unfolding in this way. I didn’t understand why we didn’t take on more volunteers. I didn’t want anyone to tell me to wait. 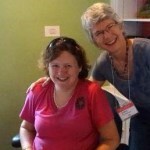 I was in classic “storming” in my April blogs. “Storming” is understandable. It is one of the reasons we must forgive each other. Without every team working towards its individual goals — even if we did not understand them — we might not have crossed the finish line we reached on June 20. Agreement and consensus forms among the team. Leadership is embraced and their roles are further defined. Stakeholders of all types will see where they can assist and not wait for “spoon feeding” or regular direction by the leader. There is less questioning of those willing to work without direction and an appreciation that “many hands make light work”. Big decisions are made by group agreement. Small decisions may be delegated to individuals or smaller teams. Unity is strong and commitment grows. There may be fun and social activities bonding people together. Working styles emerge. There is a general respect for the leader and more leadership is shared. The leader faciliates and enables versus directing. 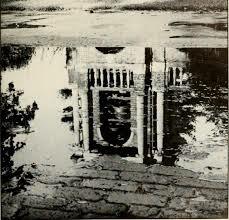 In response to the President’s comment that he “left no stone unturned”, this image shows the will of the students, faculty, staff, alumnae and CITIZENS of Virginia crying out for leadership. Norming took the shape of efficient fundraising. We celebrated million-dollar-sized milestones along the way. My team had regular conference calls. We secured a professional fundraising firm, Alexander Haas, to help coordinate things. As a fundraiser, this was a Godsend to me! The processes, procedures, lists and other tools I was used to using were suddenly available. We still had three different databases and some mis-steps along the way, but our collective apologies, thank yous and phone calls continued to yield success. Back on campus, the practical matter of students transferring and faculty securing alternative positions outside of Sweet Briar unfolded. As much as people hoped for a positive outcome, practical steps were needed. During this phase, I marveled at different teams and how much was being achieved. 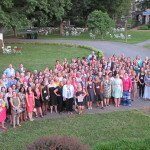 Sweet Briar 2.0, a clearinghouse website of all of the ideas and plans, launched. Plans for Reunion 2015 unfolded with a parallel track for those who didn’t want to support the College’s activities. 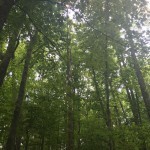 My May blogs turned to the broader issues and more advocacy outside of my Sweet Briar community. Fundraisers all over the country were held. Class challenges inspired giving from alumnae in far greater numbers than ever before. 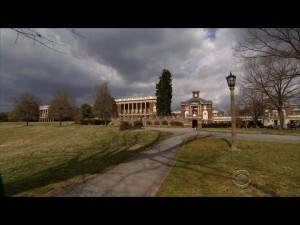 National news stories began to cover the stories of the fight to SAVE the College. In a performing stage, the team is strategically aware. The team knows what it is doing and why they are doing it. There is a shared vision. The leader no longer has to be directive (nor is he/she expected to be). Sub-groups have confidence of their role and they plunge themselves into useful activity. Reporting structures become clearer. The team attends to relationships and processes along the way. There is self-care and mutual-care with people looking after each other. The leader is able to deliver even greater results with the efficiencies and often a group of leaders will be able to expand its ranks. Salute to Daisy facing Monument Hill – a gathering of 100+ women and men as a symbolic show of unity. Looking back, it seems to me that those working to save Sweet Briar College hit the “performing” stage just in time for Reunion, 2015. The collective goodwill from the regional events and opportunity to reconnect with campus reinvigorated everyone, even if they couldn’t attend. On campus, there was greater clarity for students and faculty. Quietly, there was optimism about the possibility of success. National media stories continued with coverage of the efforts to save and the broader issues of importance to anyone. Strong leaders spoke out — and were heard. The amazing thing to me is the sense of TEAM that has emerged collectively. I have never looked at my classmates at Sweet Briar and felt we were a TEAM until now. I didn’t expect to look to the classes around me and see us as a united front. In fact, there was often subtle competition at Reunions to compete for fundraising with the last class to reach our milestones. I feel UNITED with students, parents, faculty, staff, alumnae, community and friends. 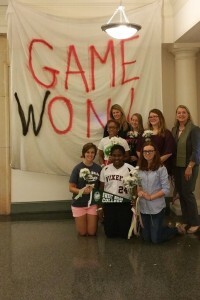 We, Sweet Briar College, are a TEAM. This team building we have undergone has been painful, jubilant and TRANSFORMING. I don’t see how this can be replicated at any other institution in the land and I hope no other place has to go through it. However, I can honestly say, I would do it all over again to reach this amazing place our team Saving Sweet Briar has reached! 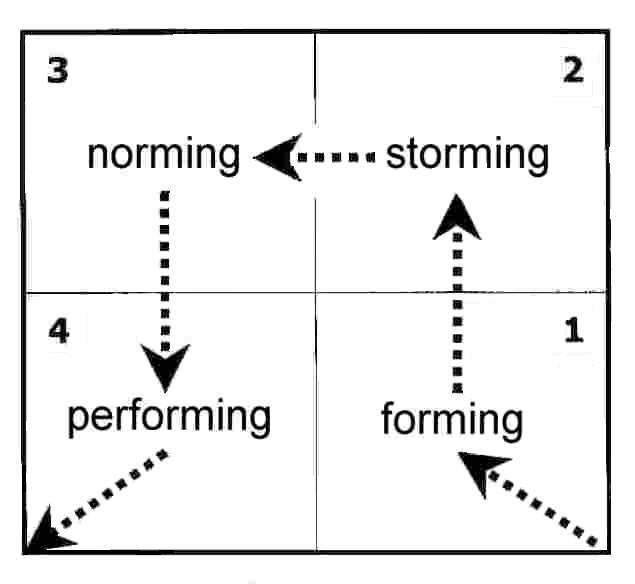 Bruce Tuckman refined his theory in 1975 and added a fifth stage to the Forming Storming Norming Performing Model which he called Adjourning (it is also referred to as Deforming and Mourning). Tuckman’s fifth stage is the break-up of the group, hopefully when the task is successfully completed. Everyone can move on to new things, feeling good about what’s been achieved. From an organizational perspective, sensitivity to this stage is helpful, particularly if members of a group have been closely bonded or feel threatened by the change. Indiana Fletcher Williams smiles a bit broader…. To be honest, I forgot about this step until I prepared to write this post. When I reviewed the material on Tuckman’s model, I hadn’t noted the fifth stage in the articles. Yet, it is very helpful to think about now whether from the perspective of the outgoing Sweet Briar College Board, the new members of the Sweet Briar Board or the Saving Sweet Briar, Inc. Board who announced from the beginning that they hoped to be “out of a job” by the end of their efforts. 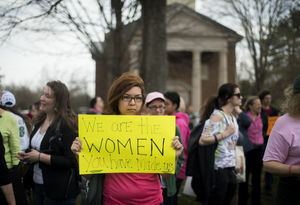 The Sweet Briar College Board collectively resigned after the Memorandum of Understanding was reached between the parties filing suit and Sweet Briar College. To their credit, they saw that their job was done. They took a vote, they took steps to execute that vote for closure and held their course. They served in a very difficult time and I am compassionate for how this must have been for them. 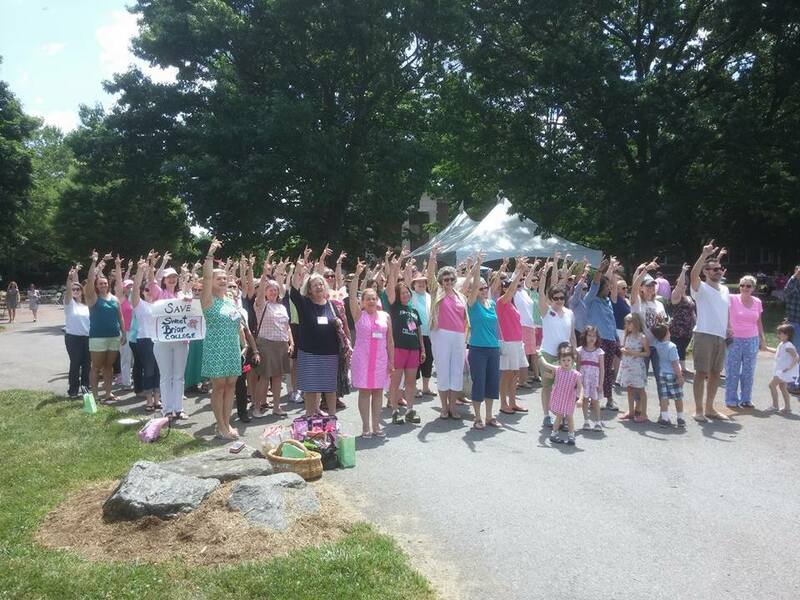 The Saving Sweet Briar, Inc. Board’s role for funding the important legal counsel was a victory – the County Attorney of Amherst achieved her desired goals and the outcome of “getting back the keys” resulted. The fundraising effort launched surpassed everyone’s wildest expectations. The work to secure a new President was successful. 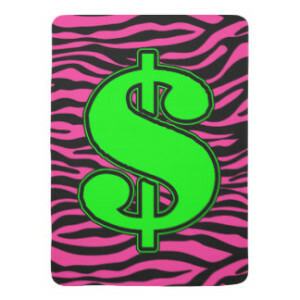 All parties to the suits put forward suggested names for new Board members for Sweet Briar College. Fortunately, there is no “adjourning” for those who have worked to save the College. The cycle begins anew. We can expect all of these stages in the weeks ahead. Hopefully, it can help us be more compassionate with those who are working on campus to welcome back students. Perhaps it could help us reach out to those who thought differently from us and welcome them into this future. We need all leaders, followers, rank-and-file, do-ers possible to begin the cycle again. Soon, we will bring to you our regularly scheduled links at the College, but we don’t yet have the keys…. SHOW ME THE MONEY (or Pledge)…by midnight tonight. While there is much to celebrate now that Sweet Briar College is saved, our finish line has moved and some hurdles have been added. The Sweet Briar Board and other parties to the three lawsuits against the College reached a Memorandum of Understanding. I shall refrain from expressing my opinion now because I have more important things to share. Help us over this hurdle! Hurdle #1: Turn over $2.5 million in cash by July 1. Hurdle #2: Turn over $12 million in cash from converted pledges by September 1. Hurdle #3: Only pledges made by midnight, June 23, 2015, will count towards the deadline. Yes, you heard me. As strange as this sounds, only pledges made by midnight on June 23, 2015 can count towards our “finish line” all the way to September. Want to be counted, MAKE YOUR PLEDGE TODAY! How can you make your pledge today? If you are reading this post AFTER June 23, 2015, please contact me via the comment form below. You all are amazing and I see you rushing to the cause, OUR CAUSE! You have been pledging and donating cash to meet the specified terms of the settlement agreement with enthusiasm and vigor! Your responses have blown the doors right off PayPal. This morning, I can say with a great deal of certainty that we will convert the $2.5 Million required to trigger the next 30-day deadline. Once we have collected the $2.5 Million, (which may take a few more days due to stock transfers and bank wiring coordination) please remember we have two more hurdles to clear to reach the entire $12 Million cash requirement by September 1. Please remember that the $21 Million pledge update announced last Friday are monies over a five year period. And what we all know in the professional fundraising world is that some attrition is possible due to unforeseen circumstances. That is why we MUST continue our efforts. Many of you have asked for daily and immediate updates. I only ask for patience. We have volunteer campaign counsel in Atlanta assisting the team of alumnae volunteers and they are doing an extraordinary job. We do not have a Development Office per se (yet!) so this volunteer force is juggling a crush of tasks – receipt of incoming pledges, telephone inquiries, check deposits, and many other important and immediate administrative details. Every detail needs to be right, and we are working around the clock to make sure of that. Please have patience and continue to trust our due diligence process. Thus far, we have navigated this great challenge to steer our college into the future with grace and fortitude. Now we are working to fulfill our Promise. This endeavor to revive our college has been and will continue to be a marathon. So please stay positive and remember our long term goal! 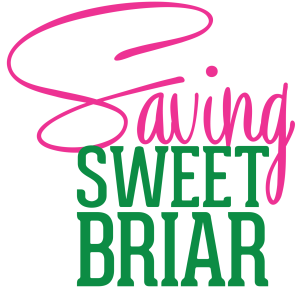 Thank you for your selfless commitment to Saving Sweet Briar. 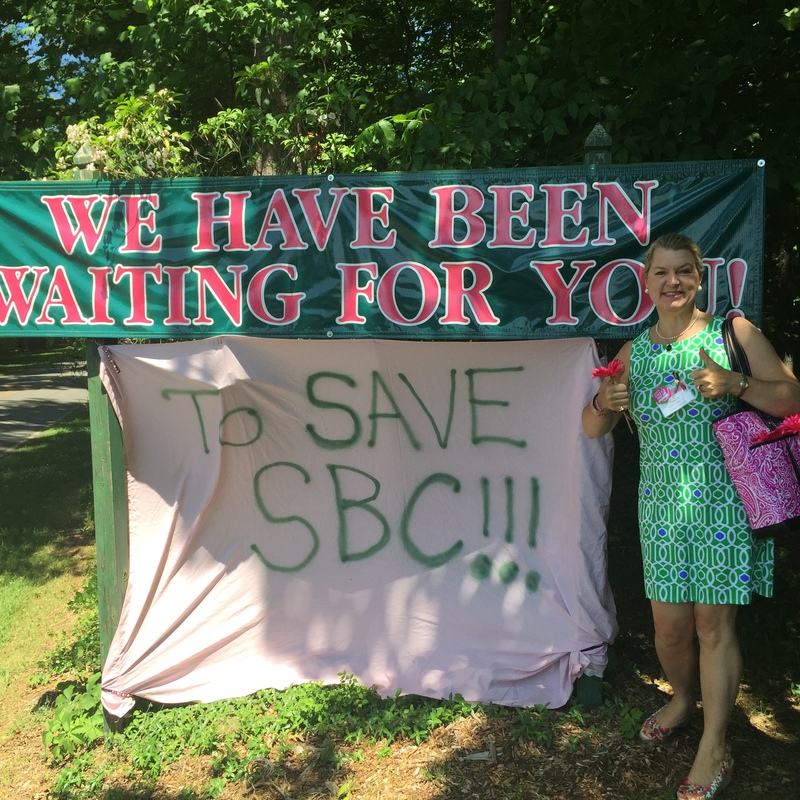 Success for Saving Sweet Briar! Yay… Now, Get Back to Work! KEYS! Saving Sweet Briar gets the keys to the College. Jubilant! Euphoric! Relieved! 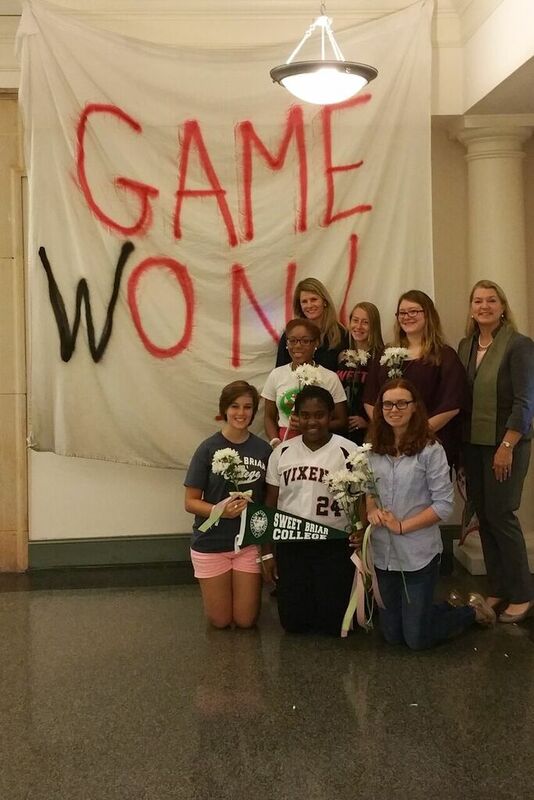 There are not enough adjectives to describe my joy at learning that Sweet Briar College is SAVED! There is a Memorandum of Understanding between the County Attorney for Amherst and Sweet Briar College. The parties to the three lawsuits have arrived at an agreement through mediation facilitated by the Attorney General for Virginia. We should take a moment to pat ourselves on the back, thank all who have volunteered, and offer a toast to the future. After that, it’s back to work. We cannot exhale yet. Now the real work of supporting a College begins. This is a very unique situation. Colleges rely on many sources of revenue to operate – tuition, giving, grants, scholarship support, alternative sources of revenue. Given the President and Board’s decision to close, many students have transferred (though many would like to return), some faculty have taken new jobs, the sources of revenue will be out of balance for a time relying heavily on contributed funds. Giving has never been more important! Alumnae support is critical at this time. Sweet Briar College needs to be the top or among the top of every family’s philanthropic priorities. Corporations have a role to play in supporting the College and partnering in areas where they are hiring. Foundations could make a unique impact at Sweet Briar College helping to shape the future. Multi-year pledges will be essential. We need to reach out to parents, friends, foundations, corporations and invite them to participate. 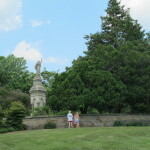 Visit Saving Sweet Briar to make a pledge or give. Elbow grease can also be donated in the form of visiting campus through organized work parties. 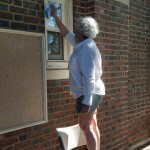 Painting, gardening and sprucing up every corner of campus is needed. 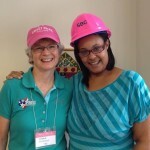 Combining a Habitat-for-Humanity-like work project with moments for fun will give alumnae a chance to bond and to serve. Those with connections to contractors would be particularly helpful at this time. 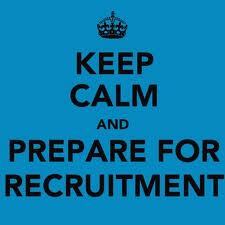 Recruiting students must begin immediately. Consider visiting your local independent school and public school College counselor. Tell them our story and invite them to encourage students to apply. 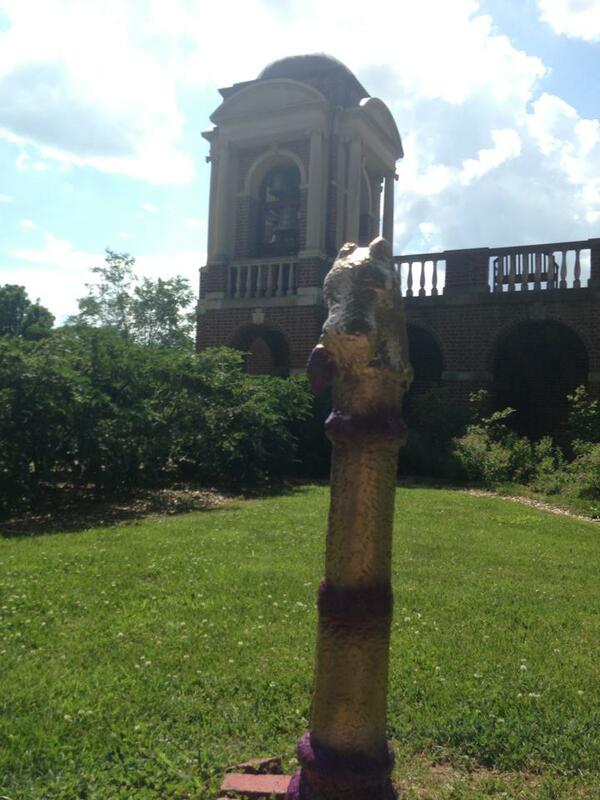 Those who will choose to attend Sweet Briar will be making history. They will also enter one of the most dedicated, generous and entrepreneurial group of alumnae/i higher education may have ever seen. Who wouldn’t want to be part of this family? 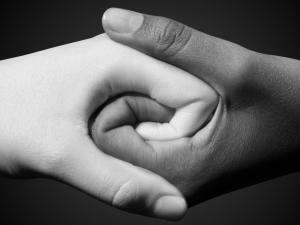 Extend the hand of friendship and reconciliation. Speaking of family, it is also important to remember that we are one. We are sisters and brothers given and amazing experience because of a generous woman, Indiana Fletcher Williams, who established Sweet Briar College as a perpetual memorial to her departed daughter. Out of tragedy, something beautiful unfolded. Anyone affiliated with Sweet Briar College is part of a broader family bonded together by a shared experience and an exquisitely beautiful place. In a time of polarization and conflict, the opposing sides saw the wisdom of coming to the table for the greater good… that any agreement between parties of different points of view requires compromise to achieve something larger than ourselves. These last few months have demonstrated Sweet Briar’s character and relevance, as well as the character and commitment of its graduates. We applaud the agreement and stand ready to continue our support for the years to come. But back to celebrating…. you deserve it dear readers, for tolerating my many posts about Sweet Briar College since March 3. 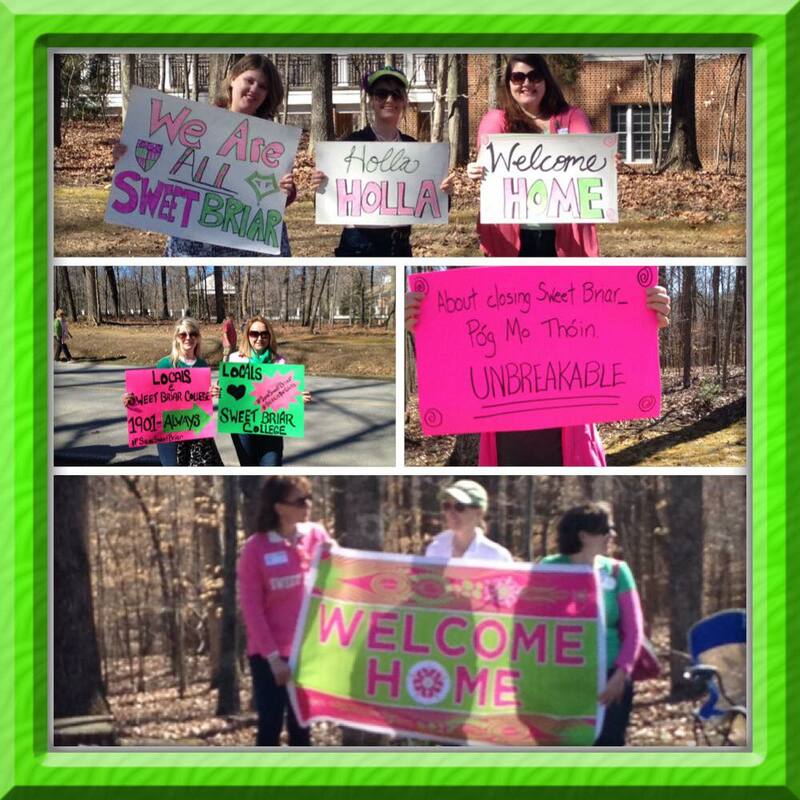 You deserve it Sweet Briar alumnae – a precious place we call home will live on. 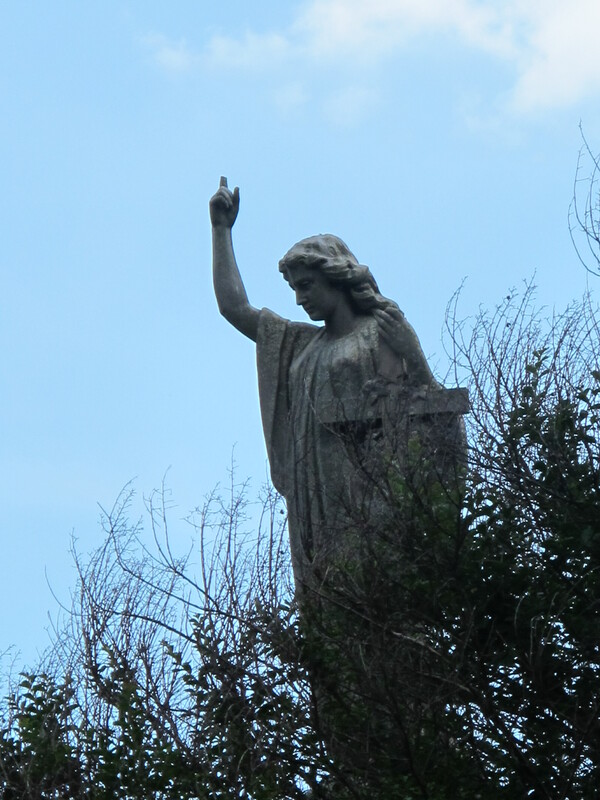 An angel over Daisy Wiliams’ final resting places raises her arm to the sky. Indiana’s shy smile beams a bit brighter today…. The President of the College and Chair of the Board have been tossed off their perches. With gratitude, I raise my right arm over my head stretched towards the heavens. I thank Indiana Fletcher Williams, the founder, for her trust. I thank the Saving Sweet Briar Board for their vision and leadership. I thank the women who gathered with me at reunion to cheer. 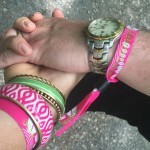 I thank my husband for tolerating my part-time passion – saving Sweet Briar! I thank my friends — old and new — for being on this amazing journey. 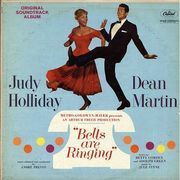 Finally, we’ve got to have a Holla, holla (Click the link below)!!!! 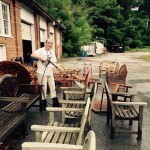 Please visit Sweet Briar 2.0 to volunteer. 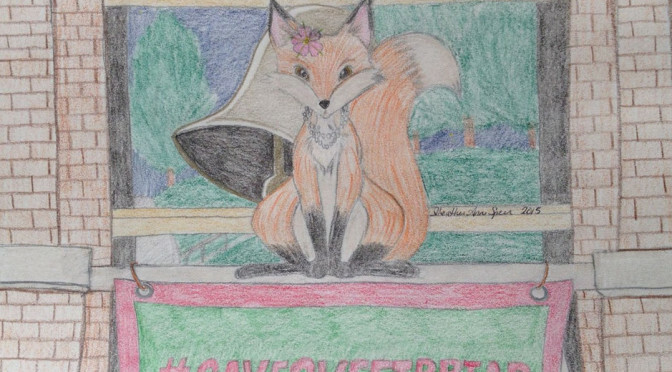 Please visit Saving Sweet Briar to pledge and donate. Someone caught this photo of me while leading a group “Holla, holla” at Reunion, 2015. 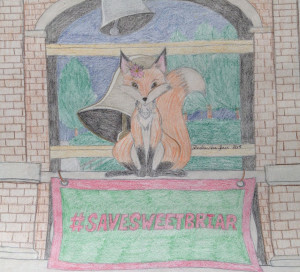 #wesavedSweetBriarDonateRecruitSweet Briar SAVEDVolunteerWork still to do! 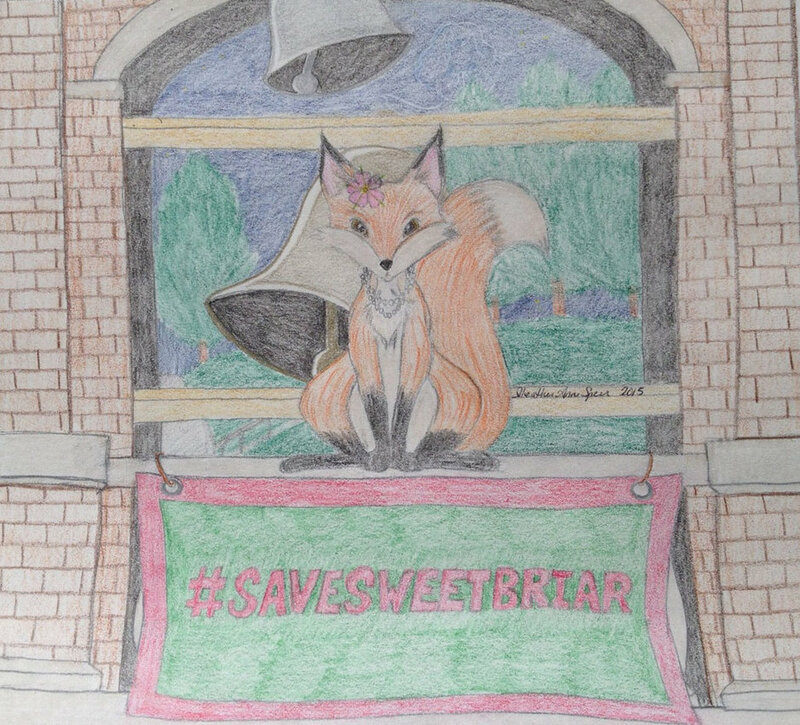 Today’s post gives a glimpse of the efforts to save Sweet Briar undertaken by one volunteer among many. It isn’t always easy, but there is much to learn in the process. 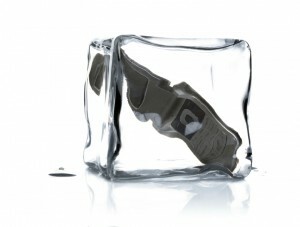 It also sheds light on the future we can expect when the legal efforts are successful. Call by call, I am filled with hope and only occasional disappointment. Yet, it is actually those calls that are challenging — “cold calls” — where I learn the most. O God, lift my soul to your mountaintops and grant that from their summits my eyes may see the true vision and purpose in my life. 86 years later, President McVea’s words were repurposed for a very different kind of service. On Saturday of reunion weekend, 2015, Sweet Briar College was doing the very opposite of what President McVea intended by her prayers. I am pretty sure she would not appreciate her words being used in a service intended as the College’s last. In tribute to her, I honor her words and others from the 2015 Service of Remembrance along with my own reflections on reunion…. 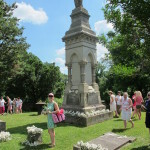 On Monument Hill, the highest spot on Sweet Briar’s 3,000 acres, alumnae sat and stood in a somber circle around the Fletcher family plot for a Service of Remembrance — intended to be the final service at Sweet Briar College. Alumnae mourning their College co-mingled with those fighting for its future. Each heard a different message. Those quitting heard words of ending, closure and death.. Those fighting heard words of hope, continuance and resurrection..
O God, the source of strength, you are my strength. In you I find power for the real work of my life. No difficulties can overwhelm me, no task can frighten me, for I know that abiding in your, as my days are, so shall my strength be. Attending a reunion is always a special time. Returning to a special place of any kind brings about a sense of anticipation. 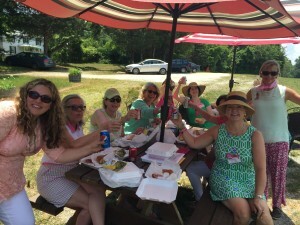 For graduates of Sweet Briar College, reunion is like coming home. This reunion promised to be an epic one. On March 3, the President and Board announcing their intention to close the College declaring the 2015 commencement would be its last and that reunion would be perhaps the final one as well. Since then, Sweet Briar has divided itself — emotionally, legally, physicially — between those who wish to quit and those who are fighting closure. While some people heard the news and quietly accepted it – quitting. Others immediately organized – fighting. O God, you Infinite Calm, let me rest in your peace. Quiet the anxieties of my life; hush the agitation of my heart; still the busy flutter of unnecessary and futile activity. In calm strength, let me pursue my daily work resting on your sure promise. Lead me beside still waters of peace through green valleys of love and hope. Others came to campus as fighters. They, too, took in their campus in a different way. These fighters; however, did not approach each set of friends or venues as a “last time” or a goodbye. Rather, they savored campus protectively and thoroughly. You could see them gaze over a familiar landscape with a sense of purpose. Some chose not to come to campus at all because they didn’t wish to put a single penny into the accounts of those not committed to the future. Taking in campus with the future in mind. O Almighty God, source of knowledge, lover of wisdom, we ask your blessing this day on the community, past and present, of Sweet Briar College. Grant to us earned purpose, the strength to persevere, and a steadfast faith in the value of human life. We realize that we are all scholars and learners together, searching diligently for truth. 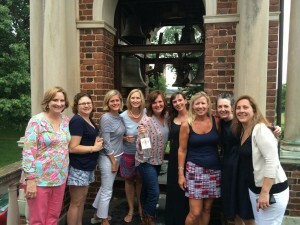 The division in the 2015 Reunion for Sweet Briar is one I hope we will never repeat. While some attended events on campus, others gathered off campus. The majority of my class attended off-campus events which were forward-looking and hopeful. My Class of 1988, normally very active had just two people for the opening events. During the picnic, I had the unsettling experience of meeting several people resigned to closure of the College including the sister-in-law of the current President who said she is taking “no position”. Thankfully, my classmates were all actively working for the future. The few and proud members of the Class of 1988 at the opening picnic. May we rejoice in our opportunities to play, in our friendships, and in all the joys experienced…. Class of 1988 classmates – one all the way from Singapore — attended the alternative event. The place that felt the most home-like reunion weekend was faculty row. 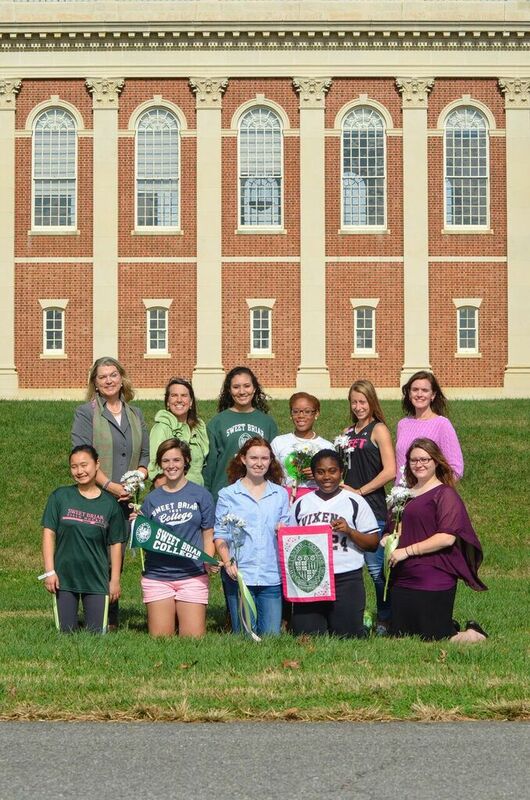 The Whitcombs, Claudia Chang – homes I visited as a student were open and united with determination for Sweet Briar. Saturday morning my husband and I visited downtown Lynchburg, a thriving Farmer’s Market unfolded along several blocks. Unique food trucks from cider donuts to fish tacos to bagels and fresh juice lined Main Street. We found a delicious latte and breakfast sandwich at the White Tavern. 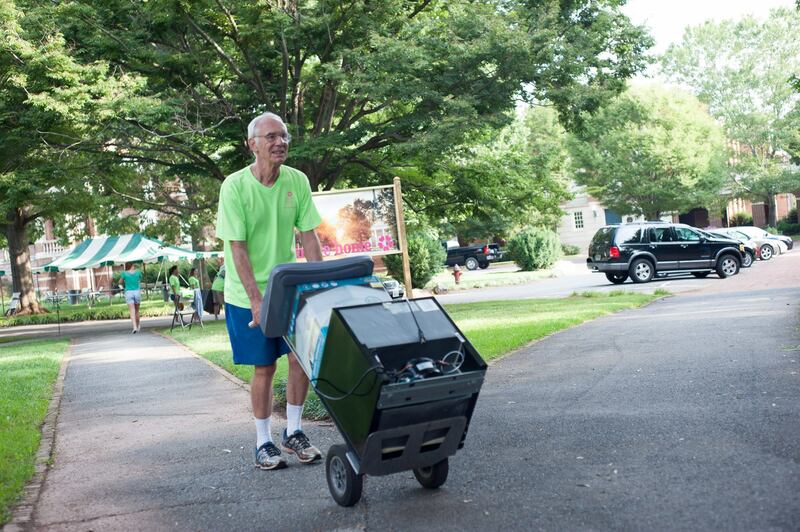 Lynchburg teemed with life: Children, college-age groups, senior citizens. Pianos donated by community members were tucked into storefronts decorated with whimsical and meaningful designs. I watched a woman play a beautiful Bach piece while her son nodded slowly, transfixed. It was only after enjoying the music for several minutes that I realized the piano was designed by a Sweet Briar College student. Above all, grant us through our work and all our experience to understand more clearly your beauty, your harmony, and your truth. This is a marvelous College town. Randolph College, Lynchburg College, Liberty University and Sweet Briar College compliment strong businesses and a vibrant arts scene. Everywhere we went there were references to Sweet Briar from signs in windows of support to business cards to fellow alumnae walking through town. Leaving Lynchburg, we drove the business route back to campus along the road I remembered. The towns of Madison Heights, Monroe and Amherst are clearly stronger than when I attended College from 1984-1988. National chains mixed with family-owned business of all kinds unfolded along Route 29. Even small florist shops were built with Georgian architecture. This is Virginia charm at its best. Before returning to campus, I met up with a group I had only previously known by phone and email (daily!) – the Major Gift Task Force members. We planned to meet up at one of the alternative events. It turned out to be at a lovely vineyard, Rebec, founded by the father of long-time dance faculty at Sweet Briar, Ella Magruder. While hundreds of alumnae flowed into the event, our group met each other (many for the first time only knowing each other previously through phone calls) and discussed the importance of this weekend for a final push for giving. We were blessed by Ella Magruder stopping by to tell us how much she and the faculty appreciate the group’s efforts. Endure us with abounding enthusiasm for real greatness, respect for the valuable accomplishments of the past, and a never failing belief in the possibilities of human attainment. Back on campus, it was time for the hike to Monument Hill. The skies were clear with temperatures climbing into the 90s. We hiked ahead of the crowd in order to look back. 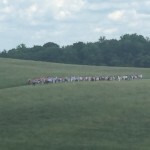 Video: Bagpiper leads walkers to Monument Hill. From the beauty of this campus may we learn to love and understand beauty everywhere. Bagpiper leads walkers from campus. Amazing forest on 3,000 acres. Bag piper leads the annual procession of walkers to Monument Hill. 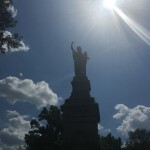 Once on Monument Hill, it was back to the surreal dichotomy of quitters and fighters. It began with an invocation, “For what may be the last time together….” My husband leaned over to me and whispered, “Is this a funeral?? ?” “NO!”, I whispered. It was a very nice service. It was very polite. It was very “Sweet Briar”. No. One. Said. A. Thing. I couldn’t help myself. As the Chaplain (who isn’t a Chaplain since the College hasn’t funded a Chaplain for quiet a while and we have a very kind local Pastor helping) said his final “Amen”,I must admit I did YELL, “SAVE SWEET BRIAR” to which the majority of the crowd responded with a cheer :). 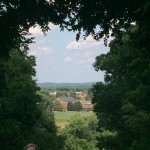 View from Monument Hill towards campus. Walkers come into the woods. 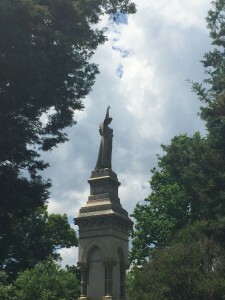 Fletcher family plot on Monument Hill. Laying daisies for the Fletcher family. Indiana Fletcher Williams established Sweet Briar College as a perpetual memorial to her daughter. Salute to Daisy with arm upstretched! 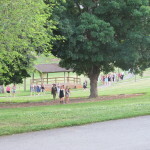 Many left their events to join in. It felt good to cheer and voice our intention at a “pep rally” of sorts. 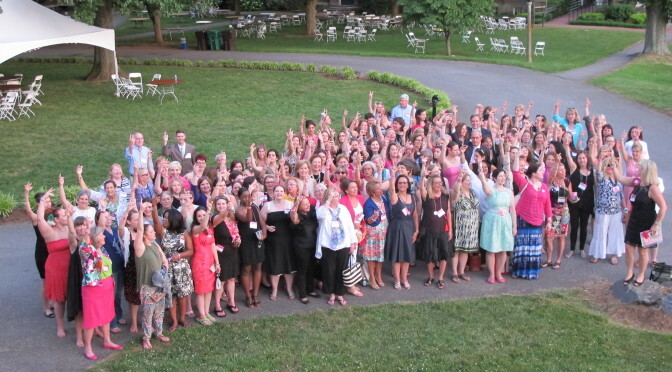 At 8:15pm, while the sun was setting, alumnae came from both ends of campus for a group photo. We sang the “Holla, holla” cheer and we shouted, “WE WILL SAVE SWEET BRIAR!” Having been on Monument Hill that day and seeing Daisy’s arm uplifted, it occurred to me that it would be a meaningful tribute to lift our arms like she does. After all, we ARE the perpetual memorial of Daisy that Indiana Fletcher Williams intended. Click here to view the video of our salute to Daisy. Even the official events divided those who were on campus. One event was held in the Field House, the other in the conference center. 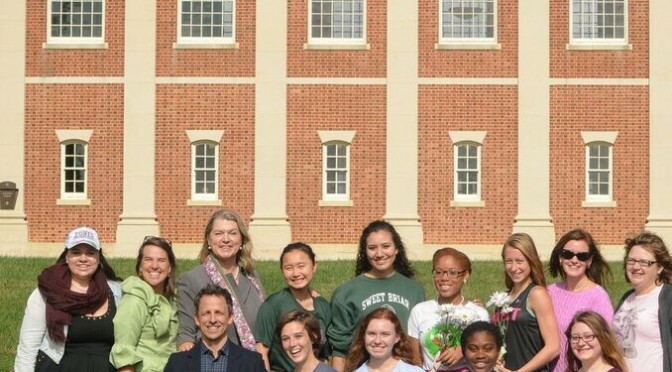 Between the two, those who are working to save Sweet Briar met in the quad for a photo together. Later, Claudia Chang, a beloved Anthropology professor (and leader of the faculty suit) hosted a party until the wee hours of the morning. I know I will never be a quitter for Sweet Briar. I will fight to the end alongside women from many generations united to save a place we love. Above all, grant us through our work and all our experiences to understand more clearly your beauty, your harmony, and your truth. As alumnae leave Sweet Briar College this weekend, in just a few days they face two important moments. Important legal challenges will be in court, including the Virginia Supreme Court. Winds of God, blow through my soul with healing and invigorating power. Enliven my desire for righteousness; cleanse me from self-seeking, from moodiness, from indifference. Winds of God, bear my soul on the quiet breezes of the morning, or on the wings of the hurricane. In the calm of the storm, may I find You, the Star of my soul.